Co-Owner Mike McHugh spends his third day at Sandals Emerald Bay participating in an Island Routes excursion. Co-Owner Mike McHugh attends the Chairman's Royal Club Meeting in Exuma The Bahamas. Co-Owner, Mike McHugh, travels to Sandals Emerald Bay in Exuma The Bahamas for the Chairman's Royal Club meeting. 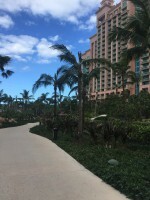 Co-Owner, Amy MicHugh and her daughters spend their third day at Atlantis touring the resort and the Mandara Spa. Amy McHugh, Co Owner of Dream Makers Vacation Services enjoys Day 2 at Atlantis with her daughters, Karlin and Madison.